It wasn’t supposed to end like this. The Cardinals had gone through too much, proven themselves too many times, to go out after a Holliday bobble in left, a Freese drop on a pop up, or a Garcia three-inning start. It just couldn’t end like that. It started with the Rangers scoring first after Jaime walked the lead off man in the first. But no worries — Lance Berkman came in and with Skip Schumaker on, blasted one to the bleachers to regain the lead, 2-1. Garcia got some nice backup from his defense early — Freese starting a difficult double play, for one — but he clearly wasn’t on his A-game. 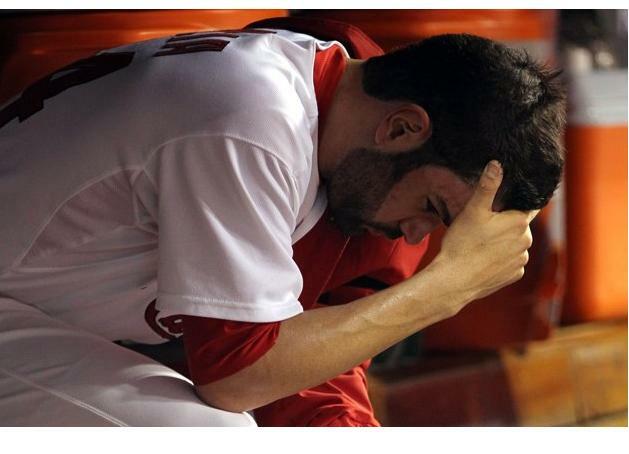 When Tony La Russa went to the ‘pen in the fourth, the game tied at two, Cardinal Nation held its collective breath. Not because the bullpen couldn’t hold it, but because the circus act had begun. Emotions were running high … and they weren’t always pleasant. The reality is, the Rangers capitalized better on mistakes that were made, and found themselves up 7-4 in the bottom of the eighth. If you’re a baseball fan, you’ve likely seen the fireworks from the 9th, 10th and 11th innings. But the reality is, it started one inning before, in the eighth. Yes, the eighth. It started with a solo home run by that one guy — the one with the lucky tortoise: Allen Craig. That brought the Cards within two, but more importantly, it gave everyone in the ballpark life again. The scoring would stop after that Craig homer. And in the ninth, the Rangers’ Neftali Feliz came on to seal the first World Championship for the Rangers organization. But then there was Albert Pujols. He doubled. Lance Berkman (who already had that 2-run homer earlier) walked. Could Allen Craig do it again? Not exactly. He goes down looking. So it’s David Freese. The hometown kid. The perfect story, looking for a way to make up for that goofy dropped pop up. A ball and a strike. Make that two strikes. The Rangers are one strike away. It couldn’t end in six. That would be entirely too predictable. How ’bout a two-run triple off the right field wall? That’ll do. Tie game. Extra innings. The Rangers weren’t just going to curl up and surrender, though. Not if Josh Hamilton had anything to do with it. A two-run bomb of his own might have done the trick! Again, they led by two runs going into the bottom of the inning. Again, the Redbirds got the first two on. It didn’t seem possible — this was the bottom of the lineup. The pitcher’s spot was up third, which should essentially be a free out for the Rangers. Right? This is the Cardiac Cardinals we’re talking about! Of COURSE it’s not that simple! A sacrifice bunt and a ground out score one run. It’s 9-8 Rangers. Walking Pujols seems smart. Especially when Feldman gets Lance Berkman to start 0-1. At 2-2, Texas is again one strike away. Did I mention Lance Berkman had a two run homer? This time, how ’bout a season-saving RBI single? And yet, after rebounding again and again, they couldn’t plate a winning run. It would once again come down to holding the dangerous Rangers’ lineup at bay long enough to earn another chance. Is that all? Well, with Jake Westbrook on the bump, why were we worried? Oh, right. Cruz, Napoli and Murphy. That’s why. But just like every other bizarre victory this postseason, Westy got it done. The Cardinals were in the driver’s seat — all they needed was a run. Just one. With David Freese leading off, followed by Yadier Molina and Daniel Descalso, the chances were pretty good. And then there was this. David Freese. Jubilation. Game 7. You can’t script October. That’s what they keep saying. As it happens, you can try. Hamilton’s two-run blast would have made for the perfect happily-ever-after ending. He’s the guy in Texas. The one with the story everyone knows. The one who has battled all odds to be here. It would be poetic to end it that way. But the writing in the stars had a different hero ending this fairytale. He’d already had the ninth inning triple. It would stop time entirely if he had a walk off bomb, especially in what had become the worst, best game in the history of the Fall Classic. Especially for the team that had an 8.4% chance of winning game six after the eighth inning. Just as his father had called it in ’91. Just as memorable as anything the World Series had ever seen. All because of a team that, as Joe said, Just. Won’t. Go. Away. I watched much of that game with my hands covering my eyes. And yet, I ended it jumping up and down in my living room with my dad, just like I’d hoped I would. As the Adorable One rounded the bases, knowing the “love beating” that awaited him when he touched home plate, the tears welled up in his eyes. It was just for a moment, but they were there. I would know, because I was fighting the waterworks, too. This is the moment you act out in your back yard as a kid. And it just happened. For a moment, time stood still. Frozen by Mr. Freese himself. There’s still one more to go, yes. But it took a game six miracle to get there. If this didn’t prove these Cardinals can’t be counted out, there’s only one thing left that can. Still can’t believe it! So proud of this team! Finish it up tonight guys!